My boys are almost 3 and very excited to know their numbers! With a summer storm brewing outside I thought it would be fun to do a quick number practice game to help them get moving and work on their number recognition. This is a really easy activity that requires no prep and just a couple of supplies - and it's FUN! To play Smack the Number, you just need a set of foam numbers and a fly swatter. I started out having my boys line up each number in order. They love to do this and sing a song they learned by watching Number Land, which is a really cute Leap Frog show about numbers that they just love! I'm convinced it's how they've learned their numbers so fast. Once they were all lined up we got out our (clean) fly swatters! They started by smacking each number that I called out. Then I just let them swat the numbers around - they loved this! And since they're made of foam, no harm done to the floor or our toes. We really enjoyed playing this game - it gave them a chance to practice their number skills and have a little fun too. Next we'll try it with our ABCs! Check out these great counting books too! 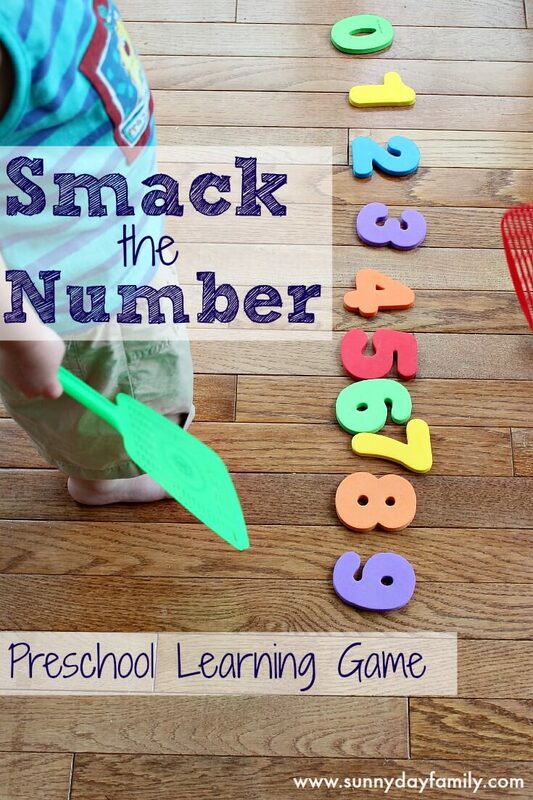 what a cute idea and a fun way to teach numbers!